Today’s story teller is a manga writer [W:Tetsuya Chiba]. For example, one of his representative manga series “Notari Matsutaro” is about a young guy who is inexperienced in sumo wrestling strives to be in Makuuchi, the top division of professional sumo. Another Chiba’s mega hit manga series “Ashita no Jo (also known as Tomorrow’s Joe)” is also a good example. It’s about a troubled young man who meets boxing and strains for victory. 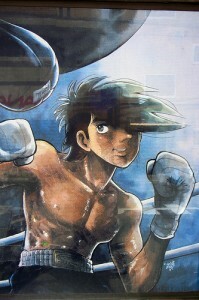 The main character Yabuki is a desperado who was wandering through the Tokyo slum but such young guy crawls up to fight on the ring of the world boxing championship. There are actually naturally talented people, and they are great but Chiba says it’s more moving to see a man in shadow struggles and reaches the top rather than a talented person. That is why he didn’t make Yabuki to be the world champion in the manga. Pamper Yourself with Gorgeous Osechi on New Year’s Day?